Last month we shared our guide on how to cook a Hunter’s Stew in the outdoors, in which we suspended a small Dutch oven over the campfire using a tripod made from natural materials. For those who haven’t made one before, here’s a quick guide on how to make your own cooking tripod. The various ways of suspending a pot over the fire are almost endless, but the adjustable tripod hanger is one of the simplest and most effective options, particularly when you encounter hard or rocky ground. Not only is it a practical tool, it is also an elegant addition to any camp. Requiring only basic tools and a few simple skills, it is quick and easy to make. For the legs of your tripod, gather three straight poles, each approximately 6-7 feet long. You can use almost any wood for this, so long as it is strong enough to support your cooking pot. For the pot hanger, find a suitable forked shoot, also approximately 6-7 feet long. Remove any smaller shoots from the stem and twist it into a withy. Trim the forked shoot from the tree and remove any excess wood to leave a hook shape, ensuring that it will comfortably accommodate the handle of your cooking pot. Test the fit of the hook with your cooking pot and make any necessary finer adjustments with your knife. Stand the three tripod legs together and bind them near the top with your withy, using a clove hitch; this step will take some trial and error to achieve the correct height of your pot hanger. Spread the legs apart to gauge the height of the hook; considering the height of the flames and the depth of your cooking pot, adjust the height of the binding as necessary. Once you are happy with the height of the binding, tighten your clove hitch. Next, spread the tripod legs and swing the hook once over the top of the binding, between the tops of the legs, and back down to accept your cooking pot. You are now ready to put your tripod to use. When cooking outdoors, as at home, you will need to regulate the cooking temperature depending on the dish and intensity of the fire – amongst other factors. This can be achieved simply by adjusting the spread of the legs. For example, to boil a kettle the legs would be spread wide, bringing the pot closer to the fire. On the other hand, to slowly simmer a stew, the legs would be brought together to raise the pot. As with any style of pot hanger, the dimensions of your tripod should be adapted according to the size and weight of your pot or kettle. To achieve both functionality and elegance, a pot hanger should be made swiftly and just strong enough for the job. 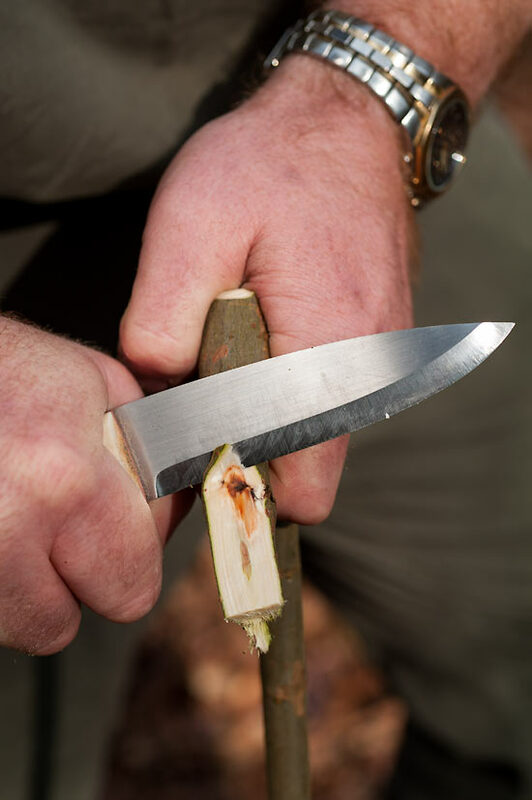 This is good bushcraft. This entry was posted in Bushcraft Clothing & Equipment, Bushcraft Tips & Guides and tagged bushcraft, campfire, cooking, Dutch oven, guide, outdoors on May 8, 2015 by Woodlore Limited. Leaving for 4 days in the backcountry in the morning. Definitely will be doing this . Thank you Mr. Mears for sharing your knowledge and skills . You’re the BEST ! Thanks for the tips guys, I’ll give this a whirl! Nice illustrations and explanation. Will have to try this the next time I’m out. These tutorials are very interesting! Thank you for sharing!